Which Renovations Give You the Most Bang for Your Buck? Home » Financial Wellness » Which Renovations Give You the Most Bang for Your Buck? A home renovation can make your house more comfortable and efficient. But despite what you might see on HGTV, renovating isn’t easy, and you won’t always make big bucks when it’s time to sell your home. 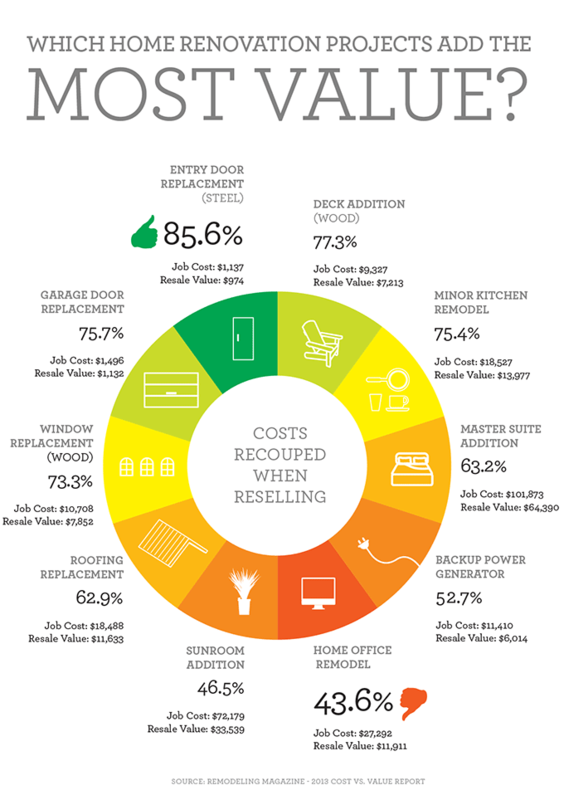 Each year, Remodeling Magazine takes a look at the cost vs. value of some of the most popular renovation projects to find out which improvements buyers will most value. Among the best investments are a deck addition, replacing the entry door with a steel door, and garage door replacement. If you’re remodeling to add something unique to your home that others may not appreciate or use, like a sauna, pool, sunroom, or home office, don’t expect to make much of that money back when reselling. You’ll be happiest if you choose a project that not only recoups some of your costs, but that you’re actually interested in. Potential buyers a few years from now may not love that pool, but when it’s 80° out and you’re sunbathing with a cocktail in your own backyard, it could all be worth it.